Thanks to everyone who linked up their shelf projects at the Point of View Shelves Link Party on Friday. There were some really great projects, so if you haven't stopped over to check them out, go take a look. This display is all kinds of cute! I have a major thing for matryoshka dolls, so this is right up my alley. I love the scrapbook paper that she used on the back of every other shelf. The shelf holds little memories from every member of the family: KJ's bronzed baby shoes, her husband's Lionel trains, her girls' patent mary janes. Such a sweet idea. I just love how this came together. 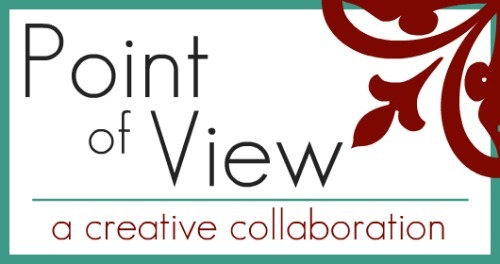 In case you missed the announcement on Friday, we are currently looking for people who are interested in participating as a guest member of Point of View. We will be including one guest each month, so if you would like to take part, send me an email (please include your blog name and URL), and we will add you to the list. You will be notified in advance when it is your turn. The Point of View theme for July is... SUMMER! Point of View is all about your interpretation of the theme. Use any medium, pattern, tutorial, original idea... it's all up to you! We can't wait to see what you come up with. The next reveal and link party will be Friday, July 22nd. Hope to see you there! Oh that is adorable!! I love the paper she used on the back. So cute! And I already have something in mind for SUMMER! Awwww...wow! you've made my day! Thanks Gwen. I loved June's theme and going through the projects that people linked up. I have so many ideas. Have a great 4th of July weekend. We are celebrating Canada's 144th birthday tomorrow! Hi Gwen..they are a really useful set of shelves and she has dressed them up with style!